Our condo is owned by one family, the Fleenors of South Louisiana. We treasure the wonderful family time we spend on Molokai and are hopeful that your time on Molokai will be as joyful and satisfying as ours is. Hopefully we have left some the wonderful family karma that we have been fortunate to experience on Molokai, behind for you and yours. We work hard to provide a clean, comfortable, well maintained property that you will truly enjoy. We appreciate your comments and suggestions and the great stories and information our guests leave in our guest book. Rather than tell you about us I would rather tell you about Molokai. Despite the fact that it has the largest white sand beach in the state of Hawaii, Molokai is almost completely undeveloped. 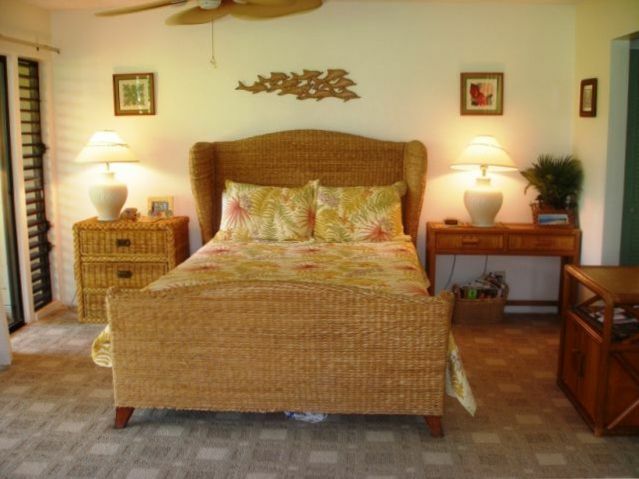 Unlike Maui, Hawaii condos are very scarce on Molokai. Most of the Molokai condos are on the west end of the island where the majority of tourist development has occurred. Using the word much and development next to each other when you are talking about Molokai it never called for. There are only three condominium developments and no hotels on the West end of Molokai. The Molokai Ranch hotel closed abruptly on April 5, 2008 with only 9 days notice. The Ranch was in a dispute with many local residents over their ability to develop La'au point, an area that historical and religious significance to the Hawaiian people. Unfortunately the Ranch owned and operated the golf course at Ke Nani Kai and the golf course is now closed. There is no word at this time on when the golf course will reopen. The closing of the ranch and the golf course are in some ways an improvement in one of the most valuable attractions of Molokai. The people who go to Molokai are discerning travelers who have learned about the beautiful un-crowded and un-spoiled beaches. They have met and shared music and food with the wonderful local people. They have learned to slow down and embrace the spirit of Aloha and to enjoy the lack of hustle and bustle. Now it is even more likely that you will have unimaginably good beaches like Kawakiunui Beach completely to yourself for the entire day. We have never had crowds and now we have this magical world even more to ourselves. The three condominium developments (Ke Nani Kai, Paniolo Hale, and the Kaluakoi Resort Colony) are all on the golf course (which is now closed) and adjacent to the beach. These three properties have a total of a little over 200 Condos. All are privately owned and are part of the Kaluakoi Resort which has the Kaluakoi Golf Course as well as Papohaku Beach (the longest and most unoccupied white sand beach in Hawaii) and Kepuhi Beach. Many of the owners of these condos never rent their units. Even during the high season (December - April) when Hawaii condos are almost all booked, the Kaluakoi Resort is a very quite, peaceful, laid back kind of place. About 15 of the west end condominium owners are retired people and are full time residents. About another 50 Molokai condos are owned by snowbirds that spend the winter months relaxing in the warm tropical breezes of Hawaii. Most of the other owners visit from time-to-time, but do not rent. This leaves very few Condos available for tourists. Although Molokai has more than its fair share of tropical wonders (beaches, waterfalls, etc. ), the peace, tranquility, and lack of tourists is one of the island's most outstanding attractions. Father Damien is known for his ministering of people with what was then widely known as leprosy, who had been placed under a government-sanctioned medical quarantine, on the island of Molokai in the Kingdom of Hawaii. He eventually contracted the disease himself, and is widely considered a 'martyr of charity'. In the Roman Catholic and Anglican traditions, as well as other denominations of Christianity, Damien is considered the spiritual patron for Hansen's Disease, HIV and AIDS patients as well as outcasts. As the patron saint of the Roman Catholic Diocese of Honolulu and of Hawaii, Father Damien Day is celebrated statewide on April 15. Upon his beatification by Pope John Paul II in Rome on June 4, 1995, Blessed Damien was granted a memorial feast day, which is celebrated on May 10. You can still visit Kalaupapa (where Saint Damine lived and worked) and ride one of the sure-footed mules (or walk) down the spectacular Kalaupapa sea cliff trail. •Visit the Halawa Valley and have Kalani Pruet (the flower man of Molokai) arrange a tour to the Moa`ula and Hipuapua waterfalls and his flower garden. This is on the east end of the island, it is green, tropical, rich with history, and an important and special place for the people of Hawaii. To get to the waterfalls you have to go across private land so you will need a guide. Kalani Pruet is one of the few remaining residents of the Halawa Valley. He is a super guy who gives a great tour at a fair price. Please be sure and give Kalani a big Aloha from Will and Sandy. The hike is not recommended for small children. Be sure and bring mosquito repellent. We leave our toys for you enjoyment. Just a short walk to some of the most beautiful (and uncrowded) beaches in the world. Great snorkeling and swimming. Thousands of songs on in the music library on the computer. Convenient to parking lot, close to pool, beautifully furnished and decorated. Back room toilet need repair. Great location even though there wasn’t a view. Condo quite run down but everything you need. Overall the property was beautiful. It must’ve been incredible when the golf course was here. It was too bad the ocean does not allow swimming this time of year because of rips and undertows. The pool was good. Better than the neighbors. The property reception and maintenance staff were very nice! Clean and comfortable unit. Good location on west side of Molokai, close to beach. We enjoyed this condo for a week Jan 2016. It was very comfortable for five of us. Two couples and an adult niece. It had most everything we needed. The knives were the best and sharpest we have ever had in a condo in 15 years of traveling. There were a lot of toys and beach stuff in the closets. One of the best stocked kitchens. the beds were comfortable. Not a lot of drawer space in the second bedroom, but we made it work. Nice new TV's, we would have preferred having cable available in the bedroom, but survived. It was nice having a computer to look up stuff and having WiFi was great. Like others we went for just relaxing, but seemed to spend time checking out the island, which has a lot of nothing to do, but we were busy for a week. The condo and complex was great, people were friendly and had great suggestions. The Island is laid back and great for relaxing. We all said we would go back, the lack of shopping and high dollar restaurants was a worry but most of us didn't really miss them. Minor inconvenience with the hours of the office, not open on Saturday or Sunday for check in, but really only needed the Pool code, which we found out later we probably could have called the manager and gotten a code to use. Also getting in Saturday evening didn't have much option for Sunday morning breakfast food, but we got coffee and some things at a little store. We didn't lose weight. the turkeys were a good alarm clock. the walk to the beach was easy and the waves crashing were fun to listen too in the condo. The people of Moloka'i were wonderful! The condo was great Thanks! The best kept secret in the world. I now know why they say Molokai mo bettah.